Lucy Kemp-Welch was born in Bournemouth. She showed an early excellence in art and exhibited for the first time when she was 14 years old. After attending a local art school, in 1891 she and her younger sister Edith moved to Bushey to study at Hubert von Herkomer’s art school. As one of Herkomer’s best and most favoured students, she was able to set up her own studio, in an old former inn known as ‘Kingsley’. In due course Kemp-Welch took over the running of the Herkomer School in 1905 and ran it until 1926, first as the Bushey School of Painting and then, after relocating it to her own home, as the Kemp-Welch School of Animal Painting. After 1928 the school was run by Kemp-Welch’s former assistant Marguerite Forbisher as the Forbisher School of Art. While still a student Kemp-Welch had a painting, Gypsy Drovers taking Horses to a Fair shown at the Royal Academy in 1895. 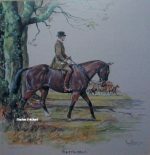 Kemp-Welch received further public recognition in 1897 when her painting Colt-Hunting in the New Forest was also shown at the Royal Academy. The painting was purchased by the Chantrey Bequest for 500 guineas, and is now in the British national collection at the Tate. In 1914 Kemp-Welch became president of the Society of Animal Painters. In 1915 she provided illustrations to an edition of Anna Sewell’s Black Beauty and used Robert Baden-Powell’s horse Black Prince as a model. As well as pictures of horses, Kemp-Welch painted other animals, flowers and landscapes. She also painted at least two Boer War scenes, In Sight’:Lord Dundonald’s dash on Ladysmith, 1901, (Royal Albert Memorial Museum, Exeter), and Sons of the City (private collection). Both of these featured horses in military action and led to several significant commissions for her during the World War One. During World War One women were employed at Army Remount Depots in training and preparing horses for military service. Kemp-Welch was commissioned by the Women’s Work Section of the Imperial War Museum to paint a scene at the largest such depot, one staffed entirely by women, at Russley Park in Wiltshire. The Museum authorities were unhappy with the painting, The Ladies Army Remount Depot, Russley Park, Wiltshire which Kemp-Welch first submitted but were aware of a larger and much better composition on the same subject that she had painted and intended to sell to a private client for £1,000. Kemp-Welch agreed that the second painting, The Straw-Ride- Russley Park, Remount Dep’t Wiltshire was the better of the two and agreed to sell it to the IWM to forefill her commission. However she was unable to agree a fee with the Women’s Work Section and after protracted discussions, donated it free of charge to the Museum. In 1916 Kemp-Welch sought and was given permission to visit the Royal Field Artillery camp at Bulford on Salisbury Plain. The officer in command of the camp allowed Kemp-Welch to set up an easel while eight batteries of horse artillery were continually rode towards her so she could sketch the horse teams in movement at close quarters. These sketches resulted in two large works, The Leaders of a Heavy Gun Team, now in the Royal Artillery Institution, and Forward the Horses. 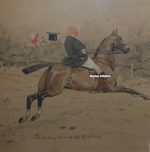 These paintings were shown at the Royal Academy in 1917 andForward the Horses was purchased by the Chantrey Bequest for the Tate. Although popular images at the time, these painting are not without their critics as they provided a heroic view of warfare but one at odds with the reduced role of horse artillery in an increasingly mechanised conflict. As well as Bulford Camp, Kemp-Welch also made studies at several other Royal Artillery camps, notably several in Hampshire near Winchester. The resulting pictures included Big Guns to the Front, an image of shire horses pulling guns through a snowy landscape, which was shown to great acclaim at the Royal Academy in 1918 and was purchased for theNational Museum of Wales in Cardiff in 1921. In 1924, for the Royal Exchange, Kemp-Welch designed and completed a large panel commemorating the work of women during World War One. From 1926 onwards she focussed on depicting scenes of gypsy and circus life and spent several summers following Sanger’s Circus, recording the horses. She resided in Bushey, Hertfordshire for most of her life and a major collection of her works is in Bushey Museum. They include very large paintings of wild ponies on Exmoor, galloping polo ponies, the last horse-launched lifeboat being pulled into a boiling sea, heavy working horses pulling felled timber and hard-working farm horses trudging home at the end of the day. Her younger sister Edith, who died in 1941, was also an artist. Like her sister, Edith Kemp-Welch also produced a poster for the British war effort, an image of Britannia with the slogan “Remember Scarborough”.